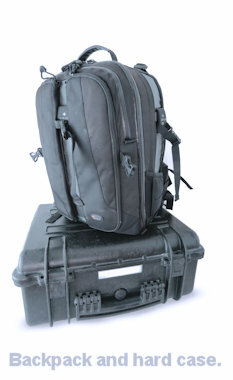 Be Prepared - For Photographers and Filmmakers. Be Prepared. It’s the quite famous motto of the Scouts. For photographers and filmmakers who work anywhere outdoors, it means as much to us as to any scout because if we don’t live by those two short but wonderfully direct words we’ll one day be on the wrong end of a nasty problem that might have been avoided had we paid ‘Be Prepared’ more attention. I thought about writing this article after I was out in the field and found myself not quite ‘prepared’ as the leg of my 055 Manfrotto tripod fell off because the bolt securing the locking joint worked loose. It’s an allen-key fitting so I didn’t have anything on my person that would allow me to tighten that bolt back up again. Luckily I was able to work around it and carry on shooting but I don’t want to find myself in that position again so now there’s an allen key that fits that bolt sitting in the camera bag. There’s a lot of detail to consider when we’re working on location and actually some stuff is quite important for the professional so lets take a look at what else we need as well as that allen key. Some pros might not consider this essential, afterall, they’re taking pictures not dispensing drugs right? Clients on the other hand are more likely to expect the creative to have it as a pre-reqiusite before awarding any commission. If someone is injured as a result of the creative or a member of their team then they could be liable for all manner of costs. It’s one of those boring but essential things to get sorted when setting up a business. One of my many definitions of a professional is someone who turns up to a commission with more than one camera. It’s one of the biggest ‘Be Prepared’ steps. Consider the scenario, out there on a shoot and the camera stops working. Who knows how much work has gone in to getting to that shoot for any number of people for it all to be wasted because the photographer only has one camera. Have at least one backup to call upon. Without it there’s at best some serious explaining to do and at worst lost clients and lost money. It’s the same for lenses. If one packs up, can you cover those focal lengths with another? What if gear is lost on a flight? I know some photographers who travel with a small kit of essential items in hand-luggage that would allow them to work regardless of that lost equipment. Upon arrival, is it possible to easily transport all of the gear to where it’s needed? Perhaps having a trolley on hand to easily move the baggage will save some time at a chiropractor in the not-too-distant future. I have a checklist of everything I like to take with me that I'll before leaving for a shoot to ensure I haven't forgotten to pack something essential. If you’ve ever worked as a photographer or a filmmaker you’ll appreciate just how much stuff we have to take. There’s always the essentials like cameras, tripods, lights, stands and light-shaping equipment but what about the bits that back-up our gear that we might need ‘just in case’? 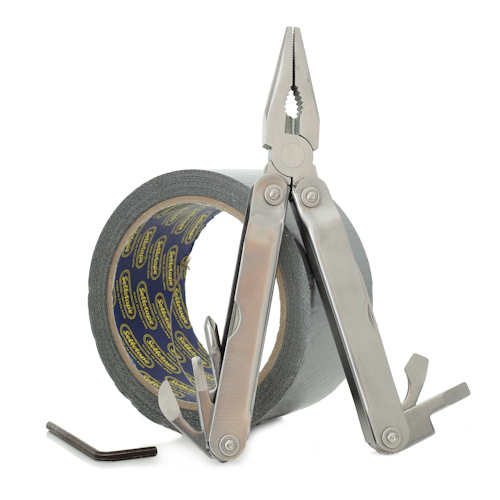 For me, it’s tools, tape, bungees, bags and no doubt you probably have a favourite backup thing that goes with you as well. These are the life-savers we’ll call upon when we’re stuck miles from anywhere, it’s always miles from anywhere, needing a this or a that to get that shot and it’s always THAT shot. My number one essential is a multi-tool that opens up in to a pair of pliers, it has a couple of screw-driver heads, even a bottle-opener. I think I’ve only used it once but it’s always there. Gaffa tape is another essential. It’s amazing how much this strong stuff can help to get through a kit emergency. Never had to call upon it yet though. Ensuring all of the batteries in camera and flashes are charged beforehand is essential. As is taking extras for when they run down. Also take the chargers with you too if the shoot's for a couple of days or more. What about sensor cleaning on the go? Thankfully bits like this are quite light and small so they fit in the little corners of the back of your car. At what point though do we draw the line? It’s not possible to take everything but it’s comforting to know that most of the bases are covered. Part of being prepared, always considering the unexpected. Shooting work outdoors means working on someone’s land. It could be private land, it could be a park near your home that’s owned by the local Council, maybe a beach at a favourite holiday spot or a National Trust or Park property. Certainly private land would almost always require the landowner’s clearance and generally, it’s worth checking beforehand to see if permission is needed to work. Having an official arriving to ask questions as you’re trying to work is a pain and there’s a real risk that the shoot could be cancelled because you’re asked to leave. It could cost money to secure that permission but it's worthwhile if it means working in the perfect location. What happens if the shoot, at a location where permission hasn't been approved, goes ahead without interruption but after the images have appeared in the advert or online and the landowner sees those images and isn't happy? Perhaps legal action follows which could be time-consuming and costly to deal with. Seeking that permission beforehand would save all of those issues further down the line. This applies to both the kit and the creative. If it’s cold outside human beings will almost certainly pack up in a huff and head back to the nearest coffee emporium if they’re not dressed to suit the conditions. Layers are always a good idea as these can be stripped off for comfort. Gear too can give up the ghost when it gets too cold. Bringing cold gear indoors will fog up lenses and viewfinders so watch out for that. What if it's hot? Sunblock, hats and covering up mean no sunburn. Also lots of water to keep hydrated. "Having medical supplies on hand could make all the difference." Gear too should also be protected from the elements. Nothing will kill a camera quicker than a good soaking or a sand storm whipped up by the wind on a beach. If I’m working on a beach I’ll take some clingfilm to wrap around my gear to keep out those nasty grains of sand. To transport my gear I’ve invested in a decent back pack and then for travelling I have strong cases which can take a real hammering. It's also useful to know where the Sun will be when on location as this will have an impact on the shoot's lighting. If it's going to be a potential light source then it's position will have an impact on when, how and where the shots are set up. If someone is injured on a shoot having medical supplies on hand could make all the difference, maybe between life and death. Having a trained first-aid person on site could also be a life saver. We Know Where You Are. Or Do We? Going out to shoot up a mountain, in the forest or down the back of beyond is exciting and we all love to do this, but these places are very isolated. Getting lost or injured and unable to return could put someone in serious danger. Let someone know your plans, where you’re going and when you’re back. Sometimes I leave a note in my car if I’m on my own as a car that’s left for long periods is easily spotted and a sure sign that something’s wrong. Being out and hungry and thirsty is a sure-fire creativity killer. Taking plenty of both for the people on the shoot will mean happy people working on the shoot. It always looks bad on the organisers if there’s not enough nosh and it’s the number one thing to quickly annoy everyone. Before a shoot it might be useful to visit the site to assess the location for any risks to the crew and models. Being prepared here can ensure a safe working enviroment for everyone, including those members of the public who may be around the location at the time. These people have to be considered as much as the people working in the team. As experience is gained most photographers will automatically do an assessment of what's likely to be required on a shoot, deciding what to pack will become second nature but safety first should be the mantra for all so if a formal risk assessment is required then it's a good idea to do one. Thinking ahead and planning for the unique circumstances of the shoot will mean a much better chance of coming back with the goods and ultimately a happy client. There's another phrase used by project managers, 'fail to prepare, prepare to fail'. There will of course always be events that can't be predicted and we certainly won't have covered every situation here, these are the things from which we have to learn to then avoid in the future. That's called experience and clients love that.